Historical forests (circa 1799 to 1846) of Indiana were predominantly composed of American beech (25% of all trees) and upland oaks (27% of all trees). I compared historical forest composition, using studies of smaller areas to approximate composition for uncommon species or genera (< 4.5% of all trees) and forest types, to current forest composition and forest types in Indiana. I also compiled published historical density estimates from small studies and estimated current density for the state. Current forests are diverse with an even composition of many eastern broadleaf species. In addition to upland oaks, which decreased to 13% of all trees, only sugar maple currently comprises greater than 10% of all trees. Other increasing species were yellow-poplar, red maple, black cherry, and eastern redcedar. Eastern redcedar increased from no presence to one of the most abundant ten species (≥ 3.5% of composition), similarly to the pine genus, becoming more common currently than American beech. Beech or oak or beech-oak forest types (≥ 24% of all trees) became eastern broadleaf forests, with no dominant species, and black cherry, red maple, and eastern redcedar forest types now occurred. Estimates of historical oak or beech forests ranged from 28 trees per hectare to 175 trees per hectare, which probably represent savannas and woodlands. Current mean density of Indiana forests is 385 trees per hectare, ranging from 180 trees per hectare to 450 trees per hectare. These forests likely contain dense layers of woody vegetation, filling the midstory and replacing herbaceous vegetation in the ground layer. Historically dominant beech and oak forests in the eastern United States have transitioned to an alternative state of closed eastern broadleaf forests due to uncontrolled establishment of many tree species. Historical forests of the central eastern US were about 55% oaks, out of all trees (Hanberry and Nowacki 2016). Because oaks typically occurred in low-density open forests of savannas and woodlands, rather than more dense forests, the total area covered by oak forests in the central eastern US probably was greater than 55% (Hanberry and Abrams 2018). Other major forest types may have been dominated primarily by American beech or pines, which comprised about 5 to 6% of trees in this region (Hanberry and Nowacki 2016). Although other genera of maple and hickory were about as common, they typically are uniformly distributed as minor components across the region rather than dominant as a forest type. Historical forests of Indiana were predominantly beech and oak (Fig. 1; Potzger et al. 1956; Lindsey et al. 1965; Hanberry 2018). Between 1799 and 1846, the General Land Office divided Indiana into 6 mile (1.6 km) square townships that were subdivided into 36 mile square sections, and surveyors recorded trees at every half mile (0.8 km). Potzger et al. (1956) used the approximately 214,500 surveyed trees to describe Indiana’s forests in bar graph format, presenting for 1000 townships only the five most common species or genera of American beech (Fagus grandifolia), oaks (primarily Quercus alba, Q. prinus, Q. rubra, Q. velutina), sugar maple (Acer saccharum), ash (Fraxinus americana, F. quadrangulata), and hickories (primarily Carya glabra, Carya ovata). Unfortunately, the tabular data, which represent many years of work transferring surveyor notes, are not present in the Potzger archive, Butler University Library. McCune and Menges (1986) documented loss of the unpublished data, including a correspondence by Potzger that anticipated the loss despite efforts to archive information in publications and libraries: “My experience with omitted tables from published papers has been very unsatisfactory . . . in 25 years, or less, such data would in all likelihood not be available.” Nonetheless, it is possible to recover information from bar charts, using regression of bar lengths with samples from publications of smaller areas, to determine historical tree percentages (Hanberry 2018). In Indiana, oaks were 27% of all trees, beech was 25%, hickories and sugar maple were 7% each, and ash was 4.5% (Hanberry 2018). The composition of other tree species out of about 80 total is unknown, but presumably, there was a natural break that caused Potzger et al. (1956) to end selection at 4.5% of composition and include no species or genera at lesser percentages. Furthermore, Lindsey et al. (1965) displayed only four major genera (Fagus, Acer, Quercus, Carya) in a state-wide map of historical vegetation, which was corroborated by smaller areas of reconstructed vegetation (e.g., Finley and Potzger 1952; Lindsey 1961). To document change in Indiana’s forests, I compared historical tree composition in Indiana to current tree composition based on recent available USDA Forest Service Forest Inventory and Analysis (FIA) surveys (FIA; FIA DataMart, www.fia.fs.fed.us/tools-data; Bechtold and Patterson 2005). In this study, I hypothesized that historically dominant species of oaks and beech would decrease and that a variety of species present in eastern broadleaf forests, including perhaps eastern redcedar, would increase. This trend has occurred throughout the eastern US, and thus, it is unlikely that Indiana was an exception (Hanberry et al. 2013; Hanberry et al. 2014a; Hanberry et al. 2018). Because species diversity is valued, the lack of tree evenness and diversity in historical forests has not been established as an important characteristic of historical forests. I also provide a comparison between structure in historical forests, using review, and current forests, using tree surveys. Lastly, I discuss various lines of evidence that historical forests were open in structure and suggest fire was the probable driver of historical forests. This study will add to the weight of evidence about the diversity and structure of historical forests and differences in current forests, which help establish an ecological understanding of ecosystems that persisted for thousands of years (Delcourt and Delcourt 1987) before Euro-American settlement. The General Land Office conducted Public Land Surveys for most of the USA during the nineteenth century. Surveyors established townships based on 36 square mile (1.6 × 1.6 km) sections, and at each section corner and midway along section lines, surveyors recorded two to four trees. Because surveyors selected trees as markers expected to last as long as possible, tree diameters generally were ≥ 12.7 cm (Hanberry et al. 2012). Surveyors recorded approximately 214,500 trees during 1799 and 1846 in Indiana. I recovered historical tree survey information stored in bar chart figures of 1000 townships (Potzger et al. 1956) by a regression (R2 = 97%) between bar lengths and numerical values of tree composition in 40 townships published in multiple studies (Hanberry 2018). I used USDA Forest Service Forest Inventory and Analysis surveys (FIA; FIA DataMart, www.fia.fs.fed.us/tools-data; Bechtold and Patterson 2005) to quantify current forest composition, which includes land with at least 10% crown cover by trees, based on live trees and presence of stumps or snags. The survey cycle was from 2009 to 2013 and contained 22,000 trees that were ≥ 12.7 cm. The FIA plots typically occur every 2500 ha and thus provide landscape scale estimates similarly to GLO surveys. I retained all species that were common in the GLO surveys and all species that had ≥ 1% composition. When comparing current forest types to historical forest types, I used counties with at least 100 trees (see Additional file 1: Table S1). The five most abundant historical species or genera were American beech, oaks, sugar maple, hickories, and ash, which represented 70% of all species (Potzger et al. 1956; Hanberry 2018; Table 1). Potzger et al. (1956) mentioned there were > 80 total species. This is approximately comparable with 90 total species recorded currently for Indiana in FIA surveys, including several non-native species and about 20 species recorded < 5 times. Because ash occurred at about 4.5% of composition and Potzger et al. (1956) did not include additional minor species or genera, I assumed that the next most abundant species or genera occurred much less frequently. In addition, a state-wide map of vegetation by Lindsey et al. (1965) presented only four major genera (Fagus, Acer, Quercus, Carya). To provide state-wide estimates of the remaining 30% of all trees, composed of about 60 more species, I tallied additional species with ≥ 1% composition listed in tables from smaller studies. The study areas consisted of two, four, or seven counties; area of upland soil types; or Hoosier National Forest, and spanned the central part of the state from north to south (Potzger and Potzger 1950; Blewett and Potzger 1952; Lindsey 1961; Lindsey et al. 1965). Juglans nigra, Ostrya virginiana, Ulmus (mostly U. americana), and Liriodendren tulipifera were common in most studies, or even the only species or genera listed in addition to the most abundant five (Potzger and Potzger 1950), and I assigned these species or genera 3% of composition. Carpinus caroliniana, Celtis occidentalis, Cornus florida, Quercus macrocarpa, and Tilia americana were species listed in at least 2 studies with ≥ 1% composition, and I assigned these species equivalently 1% of composition. That left about 50 species to comprise 13% of composition. I assigned 0.5% to any species that was mentioned or a species in a common genera (e.g., Acer, Fraxinus, Quercus) and that was present in current tree surveys at ≥ 1% composition. I assigned forest type based on any species or all species in the oak, hickory, ash, and elm genera (not only upland species) that comprised ≥ 24% composition. If there was no species or genus ≥ 24% composition, then I assigned eastern broadleaf forest as the forest type, due to the presence of a variety of tree species typical of eastern broadleaf forests. For historical forest types, I classified by township and also combined rare beech-maple and oak-hickory into beech or oak forests, respectively. To compare current forest types spatially to historical forest types, I used 60 counties with at least 100 trees in current surveys (see Additional file 1: Table S1; mean number of trees was 335 per county, number of plots ranged from 5 to 57, and number of trees ranged from 101 to 1060). Note that the resolution of counties for current forests is greater than the townships of historical forests, but the sample size of 335 trees per county is approximately the same as 215 trees per township in historical surveys. I reviewed the literature to locate estimates of historical density. I used expansion of tree counts at each FIA plot to calculate density per hectare and then determined mean density per hectare for the state and provided a range by ecological subsection (the smallest ecological units available in the FIA surveys; Cleland et al. 2007, https://data.fs.usda.gov/geodata/edw/datasets.php) for subsections with at least 10 plots. In all, there were 34 species that met minimum levels of ≥ 1% composition, or 1% of all trees (Table 1). There were 28 species in current tree surveys for the state and 22 species in historical tree surveys at small scales. Composition of tree species or genera below the 4.5% threshold selected by Potzger et al. (1956) is more uncertain in historical surveys. Oaks decreased from 27 to 13% of all trees and beech decreased from 25 to 2.5%, whereas sugar maple increased from 7 to 13%. Ashes and hickories remained stable. Yellow-poplar increased from 3 to 7%. As for minor to trace species, there seemed to be some flux in small-statured trees, from hornbeam, hophornbeam, and dogwood to sassafras, but representation of small tree species in surveys may be incomplete primarily because smaller tree species may not have been selected by historical tree surveyors (Hanberry et al. 2012). Black cherry and red maple increased from only mentioned in small studies but < 1% of composition to about 5.5% of composition. Eastern redcedar and pine were not mentioned or listed in the five studies, but now are 3.5% of composition for redcedar and 1% for eastern white pine. Beech or oak or beech-oak forests were dominant (≥ 24% of composition) in historical forests by township (Fig. 1, rare beech-maple and oak-hickory re-classified into beech or oak forests, respectively). In contrast, of 60 counties with at least 100 trees, six were oak or oak and sugar maple forest types (all oak species included) and 41 were eastern broadleaf forests, with no dominant species (Fig. 1). New dominant species were black cherry in three counties, eastern redcedar in two counties, and red maple in one county. The counties with red maple and eastern redcedar had 33 to 35 plots and 475 to 600 trees, whereas counties with red maple had 11 to 20 plots and 110 to 235 trees (Additional file 1: Table S1). Red pine also was the most abundant species in one county, although at 23.6% of all trees, this species did not meet the threshold for classification as a forest type. Surveyors also recorded distance to trees, an attribute that can be used to estimate tree density using the point-center quarter method. The bar charts provided by Potzger et al. (1956) did not contain tree distances, but Lindsey (1961) had access to the complete dataset transcribed from the historical surveys. Lindsey (1961) calculated densities in mid-northern Indiana counties (i.e., Cass, Elkhart, Fulton, Kosciusko, Miami, Noble, and St. Joseph Counties; see Fig. 2 for locations of density estimates), in part bordering oak openings and prairie. Lindsey (1961) separated forests based on four soil drainage classes; nonetheless, oak or beech and oak remained the predominant contributors to relative density and relative basal area. Densities ranged from 28 trees per hectare (ha) for oak-dominated forests to 80 trees/ha for beech-white oak forests (Lindsey 1961; densities unadjusted for surveyor bias); density values probably represent savannas (Hanberry et al. 2014b). Kaminski and Jackson (Kaminski and Jackson 1978); densities unadjusted for surveyor bias) estimated that oak-hickory forests (> 60% of all trees) contained 43 trees/ha to 75 trees/ha, or savannas, and mixed forests had densities of 164 trees/ha, or open woodlands, along the central Illinois border with Indiana. Cowell and Hayes (Cowell and Hayes 2007); densities unadjusted for surveyor bias) estimated densities generally > 100 trees/ha, or at least open woodlands (Hanberry et al. 2014a), at the border of Indiana and Illinois along the Wabash River, south of Indiana prairies. Leitner and Jackson (Leitner and Jackson 1981); densities unadjusted for surveyor bias) estimated 176 trees/ha for oak-hickory forests, or at least closed woodlands, and 281 trees/ha for mixed hardwood forests, or closed forests, in southern Illinois, which may represent similar conditions as southern Indiana. Conversely, current mean density of Indiana forests is 385 trees/ha, ranging from 180 trees/ha to 450 trees/ha by ecological subsection (the smallest ecological units available in the FIA surveys; Cleland et al. 2007). Historical oak and beech forests in Indiana transitioned to forests that are very diverse and even in composition of various eastern broadleaf species, matching trajectories of other forests in the eastern United States (e.g., Hanberry et al. 2013; Hanberry et al. 2014a; Hanberry et al. 2018). Instead of 52% of forests consisting of oaks and beech, eight different genera currently constitute 52% of composition (Acer, Fraxinus, Juglans, Juniperus, Liriodendron, Prunus, Quercus, Sassafras). Sugar maple now is the most abundant single tree species in Indiana, and eastern broadleaf forest, comprised of multiple species, is the major forest type instead of oak or beech forests. Historical forests had limited tree species diversity. Historical tree surveys, including the 215,000 records in Indiana, clearly demonstrate dominance by fire-tolerant upland oaks in this region and fire-tolerant shortleaf pine (Pinus echinata) or longleaf pine (Pinus palustris) in other regions, along with shade-tolerant American beech (based on millions of records, Hanberry and Nowacki 2016). Fire is one disturbance that filters tree species establishment, resulting in low overstory tree species diversity and density. Species diversity typically is valuable, and it is the lack of diversity and density in tree layers that allows diversity to occur in an understory of diverse herbaceous plants instead of trees. Where forests have not been converted to agricultural uses (Hanberry and Abrams 2018), oaks appear to be a relatively abundant genus in eastern broadleaf forests, or forests composed primarily of diverse eastern broadleaf species, with some eastern redcedar and introduced pines. Nevertheless, oaks have become subsumed as a component of eastern broadleaf forests, which do not provide the unique open structure and function of oak forests that supported associated diversity. Current forests in six counties now are dominated by red maple, black cherry, and eastern redcedar, which were rare to absent in the past (Fig. 1; dominant species were ≥ 24% of all trees). The resolution of current forest types is at the county scale (60 total counties) while the resolution of historical forest types is at a smaller scale of townships (1000 total), but the smaller sample size of current forest surveys resulted in a similar average of about 215 trees historically to 335 trees currently per spatial unit. In addition, although smaller scale studies that I used to assign state-wide composition for minor species were in the central part of the state, from north to south, a state-wide map of historical forests at the county scale by Lindsey et al. (1965) contained only four genera (Fagus, Acer, Quercus, Carya). Moreover, drawings of tree distributions in northern Indiana by Finley and Potzger (1952) and Lindsey (1961) did not delineate any red maple or black cherry, which are now dominant in three northern counties. Similarly, eastern redcedar was not mentioned in any publications of historical surveys, except for a surveyor field note listed by Ross (1951), who examined a five county area in southern Indiana historically dominated by beech, sugar maple, hickories, and yellow-poplar, including one county where eastern redcedar is now dominant. Overall, multiple sources of documentation indicate that none of the new current dominant species (≥ 24%) were dominant in the past. Likewise for pines, only Ross (1951) found 14 individuals recorded. Currently, total pine composition is about 3.5%, primarily from red (Pinus resinosa), shortleaf, and Virginia (Pinus virginiana) pines, most of which likely were planted (Jenkins and Parker 2000). American beech currently is less abundant than both eastern redcedar and pines, probably due to a combination of forestry practices and land use that remove trees, consequently allowing faster-growing tree species to be more competitive than beech, and disease. Beech bark disease, which is a slow-spreading disease consisting of insect and fungal components, produces cankers that over time result in mortality through girdling or bole-breaking (Cale et al. 2017). The future for remaining American beech in the eastern US may be persistence in a shrub state, after re-sprouting. Beech forests have started to become dense thickets or in some cases, pole-sized trees. Loss of mature trees and unique old growth beech structure has impacts on dependent species, at the least due to loss of beech mast (Cale et al. 2017). 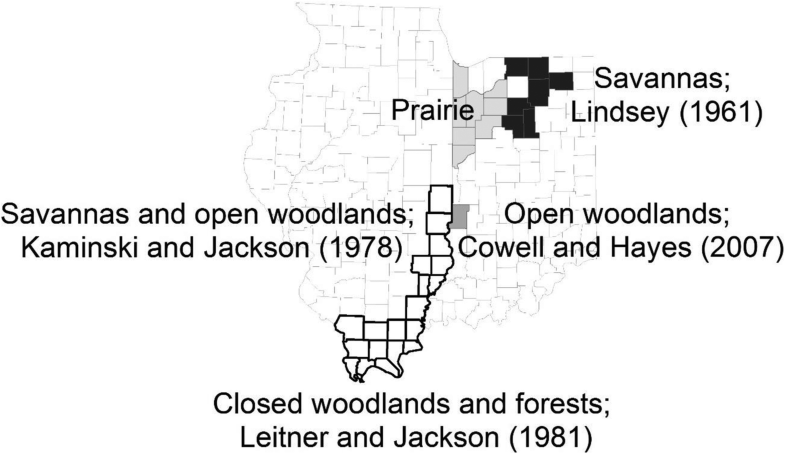 Historical forests ranged from savannas to closed woodlands in structure, based on two studies in Indiana (Lindsey 1961; Cowell and Hayes 2007) and two studies in adjacent Illinois bordering Indiana (Kaminski and Jackson 1978; Leitner and Jackson 1981). Although these studies do not provide broad coverage of central and southern Indiana (Fig. 2), these results are similar to the range of density estimates from historical forests in nearby Minnesota and Missouri (Hanberry and Abrams 2018) and may be representative of the range in historical forest structure present in Illinois. At minimum, prairies and savannas occurred in the flat northern part and perhaps extended into central Indiana (Lindsey 1961; Kaminski and Jackson 1978). It seems unusual to consider beech-oak forests as open forests, but northern Indiana was the most sparsely treed part of the state, excluding prairie in northwestern Indiana. Beech was dominant in the central part of the state, providing a source of propagules to northern Indiana. In addition, although not known for fire resistance, beech is able to re-sprout after damage (Swan 1970), which may have been a trait that allowed beech co-existence with open oak forests in fire-exposed landscapes. Even though about 38 cm in diameter, beech were about 9 to 15 cm smaller in diameter than white oak (Lindsey 1961). In more hilly or riverine landscapes of southern Indiana, open woodlands and closed woodlands may have occurred, with some amount of closed forests (Leitner and Jackson 1981; Cowell and Hayes 2007). Multiple lines of evidence indicate that the “forest primeval” of the eastern United States was in actuality open forests, which are bilayered, with an overstory canopy and herbaceous ground layer, and an absence of woody vegetation under the overstory canopy. For example, fire-tolerant oak and pine species were dominant in historical forests (as presented in this study; Hanberry and Nowacki 2016; Hanberry et al. 2018), and surface fire is a mechanism that removes tree regeneration, thinning forests; surface fires were widespread in the past, based on fire scars and other evidence (Williams 2002; Varner et al. 2016). Where densities have been estimated from historical tree surveys, historical densities generally have indicated open forests (compiled here, also Hanberry and Abrams 2018). Trees recorded during the historical surveys represent a long line of long-lived oak and pine trees that covered a large extent of the eastern US, as shown in pollen studies (Delcourt and Delcourt 1987). Herds of large grassland bison (Bison bison), along with elk (Cervus canadensis) and other species that rely on herbaceous species, used these forests (Butler 1895; Gates et al. 2010). Frequent, low severity fire was a widespread process that controlled tree regeneration, particularly of non-fire-tolerant species, preventing capture of growing space by trees (Williams 2002; Hanberry and Abrams 2018). Although factors such as drought or soil restrictions may create open forests, most of the eastern US now supports closed forests. Without control of tree regeneration, open forests densify to closed forests, which have dense tree growth throughout the vertical profile to the upper canopy. Surface fires prevented development of a dense, closed midstory of trees, which outcompete the herbaceous ground layer, as explained by contemporaneous witnesses of pre-settlement forests and processes (Day 1953). For example, from historical accounts “…the Indians frequent fiering of the woods…makes them thin of Timber in many places, like our Parkes in England” Johnson (1654; cited in Day 1953); “The Savages are accustomed, to set fire of the Country in all places where they come; and to burne it, twize a yeare, vixe at the Springe, and the fall of the leafe. The reason that mooves them to doe so, is because it would other wise be so overgrowne with underweedes, that it would be all a copice wood, and the people would not be able in any wise to passe through the Country out of a beaten path . . . for this custome hath bin continued from the beginning. . . .For when the fire is once kindled, it dilates and spreads it selfe as well against, as with the winde; burning continually night and day, untill a shower of raine falls to quench it. And this custome of firing the Country is the meanes to make it passable, and by the meanes the trees growe here, and there as in our parks” Morton (1632; cited in Day 1953); and “And whereas it is generally conceived, that the woods grow so thicke, that there is no more cleare ground than is hewed out by labour of man; it is nothing so; in many places, divers Acres being cleare, so that one may ride a hunting in most places of the land, if he will venture himselfe for being lost: there is no underwood saving in swamps and low grounds that are wet . . . for it being the custom of the Indians to burne the wood in November, when the grasse is withered, and leaves dryed, it consumes all the underwood, and rubbish, which otherwise would over grow the Country, making it unpassable, and spoil their much affected hunting; so that by this means in those places where the Indians inhabit, there is scarce a bush or bramble, or any combersome underwood to bee seene in the more champion ground” Wood (1634; cited in Day 1953). Compositional changes represent changes structurally and in the disturbance regime. Loss of fire-tolerant oaks signals exclusion of the understory fire regime. Concurrently, without understory removal or management of tree regeneration by fire, trees captured the growing space, creating a dense midstory, resulting in closed forests. Current forests appear to be closed forests, based on density estimates. Lower density estimates may represent closed woodlands, but are more likely to be low-density closed forests that contain many smaller diameter trees that fill the vertical profile; current forests do not have the grassland ground layer and sparse midstory characteristics of open forest without surface disturbance (Hanberry and Abrams 2018; Hanberry et al. 2018). Land use and forestry practices provide overstory disturbance, or removal of larger diameter trees, without understory tree control (Pan et al. 2011). Loss of historical forest ecosystems has widespread consequences to dependent species, particularly herbaceous vegetation with high light or fire requirements, pollinators that rely on forbs, animals that forage on herbaceous plants and associated insect populations, and animals that use open structure (e.g., early successional birds) or acorns and beech mast (e.g., Gilliam 2007; McShea et al. 2007; Wood et al. 2011). Indiana’s historical oak and beech forests and current diverse eastern broadleaf forests are representative of the transition in state from forests dominated by a few species to closed forests composed of many tree species. Historical open forests of fire-tolerant oaks have become closed eastern broadleaf forests, and American beech trees are rare and succumbing to beech bark disease. The transition in Indiana is representative of most forests of the eastern United States, which have become more diverse and closed through tree densification, due to uncontrolled tree regeneration without the filtering effect of fire (Hanberry and Abrams 2018). The historical dataset is available at US Forest Service archives (https://www.fs.usda.gov/rds/archive/; https://doi.org/10.2737/RDS-2018-0038).